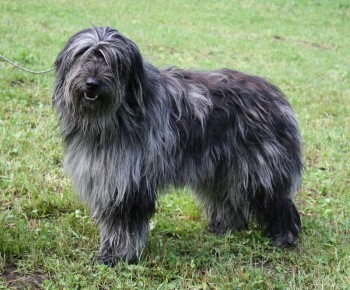 The adult dogs have a very abundant coat which is the most striking characteristic of the breed. The front half of the body has a harder textured coat with wavy locks, while half way from the chest to the back of the body, and on the legs, the coat develops matted strips the length of which depend on the age of the dog; on the face the coat is less rough and falls over the eye , hiding them. The coat develops progressively in time and does not become fully matted until two and half to three years old. The colour is solid grey or merle of all nuances from pale grey to black; and shades of Isabella and light fawn are also permitted. Solid black is permitted provided it is opaque. Solid white is not permitted and is a disqualifying fault, as are wall eyes. White patches are tolerated as long as they do not exceed one fifth of the whole coat, otherwise it is a disqualifying fault. The coat of the Bergamasco sheepdog does not require as much attention as one might suppose. The matted strips form naturally. Particular attention must be paid at about one to one and half years old when, in some specimens, the coat can tend to form a uniform matted fleece. In this case, the coat must be divided by hand into strips a little at a time. The coat should never be cut except under exceptional circumstances but worked by hands making large wide strips of about 3-5 cm wide. In the front part of the body and around the ear, these strips must be divided so that large matted patches do not form. The adult dogs that live in the house can be bathed quite frequently, while those specimens that live outdoors should be bathed less often. It is very important not to brush the coat while the hair is wet. Once the coat is dry, the beard and the forelock can be brushed out. The coats of older dogs can be trimmed when it gets particularly long, especially round the genital area. If the coat is well cared for your dog should not smell. Show dogs should not have their coat trimmed but it should be clean, abundant and of the correct texture.